Crystal Clans™: go to the crystal country to save the princess! 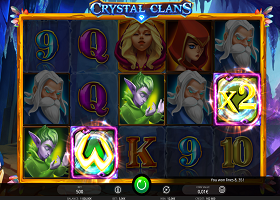 The 3D slot machine of 5 reels and 3 rows of the Isoftbet provider will take us directly to the heart of Crystal, an imaginary and fairy country where we will be able to meet extraordinary characters, where we will have as mission to save the princess this which will have the impact of making us win a lot of coins! The day rises in the beautiful country of crystal, the beautiful purple mountains are drawn around the blue Crystal Cave from where kinds of stalactites hang. You can also see multicolored crystals as plants. This place that leaves us amazed has now become the home of our princess. The Kingdom of Crystal is in danger: The King, easily recognizable in the 3D slot machine, with his serious semblance, his gaze frozen in the distance, his beard well maintained, his blue tunic with golden edges which lets well see his class, was caught in an ambush, ordained by his brother who wants to steal the throne. The king is good and generous with his subjects everyone adores him, his kindness is recognized by all even by his opponents. His wife died shortly after the birth of the princess and he had to raise him alone with the help of his maids. But the king’s brother, on the contrary, is petty, jealous and above all demonstrates an incredible power greed. The princess, beautiful girl with long blond hair and identified in the money game of Isoftbet Crystal Clans™, by her tiara with an impressive ruby in the center and a c cape color wine that leaves a sublime contrast. She was able to escape thanks to her loyal servant, the little brunette with the big blue eyes and the red cloak that in the game takes out her two daggers to defend her friend and Princess of the Kingdom, that no one dares touch it otherwise they will deal with her! The two young girls, must fetch the magician of the kingdom, who looks very much like Merlin, and who by order of the king, his friend, keeps the magic gem (the Scatter of Crystal Clans™) and which in the wrong hands has an impressive power, it is the key to open the door of the chamber to the treasure and then to be done with the king out of battle, hidden in the mountains by his brother, the more the jewel he would be crowned king of Crystal. The bad brother is helped by a green elf with sharp ears and incredible magical powers. In the game Crystal Clans™ when it gets active we see two balls coming out of his hands… Not really friendly this elf but it will still be one of the most lucrative symbols in Crystal Clans™! He will sue our two friends to try to find the magician’s hideout… But he’s going to have some work… These two are pretty smart. And in addition they will give us some not negligible gains at all! They finally arrive after many adventures and flee the green goblin with magical powers, at the famous grotto of the Royal magician located at the top of a cliff of blue crystal and take refuge inside! That’s it, nothing will happen to them, the great magician will protect them and together they can go and save the good king from the hands of his horrible brother. In addition, the characters will make us spend a good time with simple features but not stingy so far. The other less-paying symbols are the symbols of a card game A, K, Q, J, 10, and 9 but they are not to be overlooked if they combine with winning multipliers it can be giant! The wilds are represented in the 3D slot machine of Isoftbet, by a u that looks more a three upside down on a green background. They substitute all symbols except scatter symbols. We can, if we harvest 5 wilds symbols get to win up to 20,000 coins. Scatters are the gemstone of red crystal like a beautiful ruby surrounded by gold will make us win free spins but never the same amount. For example for two scatters we will be able to harvest 10 to 15 free spins and if we are lucky for 5 scatters we can receive from 36 to 50 free Spins! It’s not beautiful It? In addition if you combine scatters or wilds and win multipliers x2, X3, X5 or x10 it can be the ultimate! 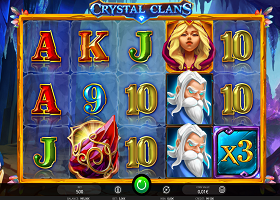 This Isoftbet Crystal Clans™ 3D slot machine is really not radix. 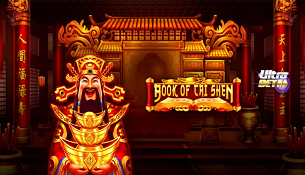 This Isoftbet slot video of 5 reels and 3 rows, and 50 pay lines, released on September 14th, of 2018, is not feature-rich, wilds, scatters and payout multipliers, but it nevertheless has beautiful graphics and a soundtrack absolutely incredible: it makes us so much that it gives us the desire to continue to press the spin button. The background colors of purple gradients and blue tones for the crystals of the entrance and also for the interface prints us a Zen image, which is very nice. This machine under has a return of 95.22%, A volatility of medium to high which is not bad, and the stakes range from 0.5 pounds to 500 pounds that will make the happiness of the gamblers who like to bet big. Moreover, there is also the AutoPlay which can make up to 1000 laps without stopping but it depends on the players, many prefer to play spin by spin there is more suspense. 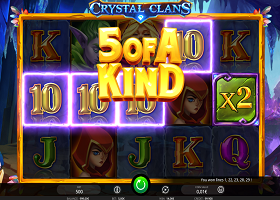 This slot machine in 3D Crystal Clans™, I enjoyed it very much, it does not take long to give prizes, has come out multiplier of earnings… What are you waiting for to try it for free? Subject : Crystal Clans™: go to the crystal country to save the princess!